My relationship with Accor Hotels started on an evening last September 2015, when I was caught on traffic on my way to THT Proklamasi Hospital. At that time, my phone rang from an unknown number, and a happy-go-lucky voice said hello. He introduced himself as Hendra Zein, but preferred to be called as "Bella". Hendra Bella is a telemarketer of Accor Hotels who sells Le Accor Plus membership program. I had established my answer to him because I didn't think I need that kind of hotel membership program. But the call that finally ended in an hour or so made me changed my mind. He was so good in persuading people, Hendra melted my heard and made me said "yes". He was very entertaining and made me laughed out loud, that I forgot that I was stuck on a hell-o-traffic. Since then, I was a member of Le Accor Plus. One of the benefits of Le Accor Plus member that made me droll the most is a chance to get a two night stay for free in any Accor hotels in Asia-Pacific. And that was also what Hendra told me when I said I don't really like staying in a chained hotel. He said, "what you need to do is just pick the most expensive hotels to spend the night, and "you'll get your money back already"." Almost a year after my membership started, I finally arrived at my chosen hotel: Sofitel Bali Nusa Dua Beach Resort. The pictures looked amazing, but the price per night was not a blessing. It started from IDR 2.7mio per night. But, prices never lie. 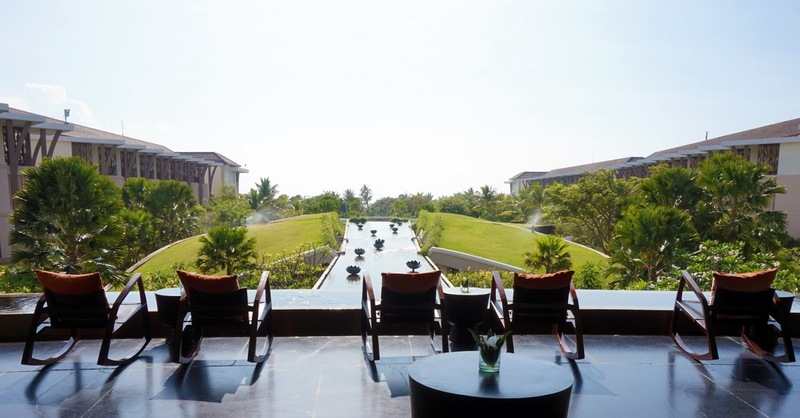 Staying at Sofitel Bali Nusa Dua Beach Resort was one of the best hotel experience I had. And lucky me, that night I got a room upgrade. Not only a level up, but five straight levels! From a stadard Luxury Room, I ended up staying in Prestige Suite with Plunge Pool! Another side of the receptionist area. They have a small "library" too here. When I opened the room, I shouted "OH MY GOD". Yes, I was being norak. But opening up a door to this awesome room, who can resist? And the norak-ness didn't stop there. Another "OH MY GOD" moment happened again when I saw the bedroom. Whoa. They got a bathtub inside the bedroom! But, it wasn't the uber cool room that made me excited the most. Suddenly, I remembered the receptionist mentioned something about "pool" when I checked-in. So, I opened the curtain and saw this. And there goes my "coolness". I GOT A POOL IN MY ROOM. Well, it's actually just a plunge pool, where we can only dip in, not swimmin'. But still. It made me felt like a rich chigga. I was very happy with the room, but... I didn't go home with no complaint. Never stayed in any Accor hotel before, but I found a similar problem with Novotel, where I stayed the previous night. There's something about Accor's choice of bedding that doesn't suit me very well. In fact, my friend even moved to the sofa bed because she felt more comfortable sleeping there. Other than that, for this kind of luxury room, Sofitel Bali Nusa Dua Beach Resort still charge for mini bars and the Nespresso machine. It's just doesn't make sense. Because these kind of room usually put an all in on the bill for everything in that room. Example: Quincy Hotel Singapore. But nevertheless, those two complaints didn't ruin my stay here because the excitements that I received far exceed the disappointments. Another perks of staying in a Presitge Suite is that we're given the access to the Club Millésime -- or also known as the Executive Lounge or Club Lounge in another hotel. There, I can enjoy a free and more private breakfast, afternoon tea, evening cocktail, and even an access to a special pool that can only be enjoyed by Club Millésime level guests. Yes, I've only been to four Executive Lounges so far, but Sofitel's Club Millésime's is the best in terms of service. The service was UH-MAY-ZING, the servers' were so kind and friendly, and their spoken English skill are above average. Not to mention their pineapple-mango juice. Très délicieux. And one more thing, the choice of the à la carte breakfast was interesting because they had steak on the menu. Those are the special perks. But the other facilities that can be enjoyed by all guests -- and the ones that also becoming Sofitel Bali Nusa Dua Beach Resort's pride is the majestic swimming pool. Awesome, isn't it? Lastly, just like the majority of hotels and resorts in Nusa Dua, Sofitel also has its own private beach, which is Nikki Beach. Dominated by white decor, made the beach that also own its beach club looked so pretty and elegant. So, if you're planning on staying at Sofitel Bali Nusa Dua Beach Resort, I strongly suggest you came in on time on the check-in clock, so you can fully maximize your time to enjoy the facilities this hotel has to offer. So, let me tell you something. Eventhough you're the kind of person like I am -- which don't really like staying at a chain hotels, but trust me, saying yes to Hendra's offer and becoming a member fo le Accor Plus was one of the best choice I've made in my traveling history. Believe me, it's worth every penny. Just drop me a comment with your email below or a message to blogkania@gmail.com if you need Hendra's number, and I'll have him call you. And just to be clear, I don't get any commission from this, it's purely a satisfied customer testimonial. Thank you, Sofitel. Thank you, Hendra.